The 2014 racing season has started. However, some athletes may be behind in training and the thought of a race makes you shake your head and think, “There is no way I am ready to race right now.” I’ve heard that before and there are plenty of legitimate reasons for being in this situation. The question is what can you do now to get in shape quickly but safely. There are many things an athlete can do (and not do) to come from behind in the game of race preparation. This is a place where the uneducated and ego-driven athletes get discouraged, while the smarter, more self-confident ones come from nowhere to have a great year. I often tell my athletes, “Worry about the things you can control. Not the stuff you can’t”. I believe that there are three areas of your preparation you can control and utilize to be at your best in no time. Your intensity during a workout is something you can control 100% of the time. You have 20 gears gears on your bike so use them. You can walk during your runs. Don’t worry about your power or pace and simply relax. This is where you need to take a very objective and honest look at yourself. A favorite saying of mine is, “You must race with what you have right now, at this moment, not what you had last week, not what you had last year, not what you want to have.” The same thing goes with training. This is also the time to go by feel and heart rate. This initial phase of training should be focused on repetition and re-training the neurological system to do your sport of choice. The more pedal strokes you get in the better at this point. One way we can get in lots of volume is to back off on the intensity. This is the basis of long slow distance (LSD) training. For you wattage and numbers geeks, play around with Training Stress Score® (TSS®) and how you feel afterwards. All TSS is NOT created equal. Go for a long but easy ride over four hours that accumulates around 200 TSS points. Now compare that with how you feel after a race or long hard group ride that accumulates 200 TSS points in only three hours. You will notice a difference. Simply put, back off and focus on form and efficiency. The power and speed will come back quickly but you must be patient. 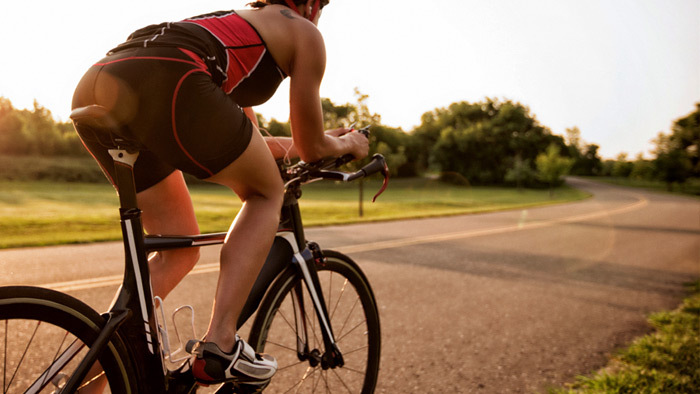 Many athletes will wonder about getting back on the bike or run and putting some big mileage. Let me explain. First, you need to redefine big. I’m not suggesting you get back at the volume you had during the biggest weeks last year. I spoke with a triathlete a few weeks ago regarding getting back into running this summer after a winter of minimal running. I was overheard by two people. One of them heard me recommend the athlete run every day. The other heard to not run more than 30 minutes. They both heard correctly, just not the whole story. By keeping the duration shorter than normal (for you) we can reduce the amount of stress we put on the body, let it recover before we go out again, in 24 hours or so. We want to go just long enough to get an adaptation but not so long we overload the system risk getting injured or digging a hole with extreme fatigue. Shorten your duration to something manageable given your current level of sport specific fitness. Forget where you were last year or where you want to be and be realistic about your fitness that day. Leave the ego at home and save it when you really need it. By being very consistent with your training short workouts add up fast. If you ride 90 minutes a day for 6 days that’s 9 hours of riding! A 30 minute run doesn’t seem like much to an experienced runner or triathlete, but 6 days of that means 3 hours of running that week. Plus, having a full day off to recover nicely and start up again next week will keep you fresh enough to have another consist week. As I have said many times, consistency is king. I focused on this idea in my last article here on TrainingPeaks and during my webinar on winter training. No matter what time of year it is, consistency is the key. So you crushed yourself on the Saturday group ride and think, “Oh man, I have a lot of work to do.” Yes, you do, but if you’re shattered from one workout you likely you won’t be doing any work tomorrow. That type of inconsistent training will not get you the results you want. By controlling and lowering your intensity you can be more consistent with your training. This lets you get in that volume needed to rebuild a strong neurological system and the muscle memory to be back at your best without injury or other overtraining symptoms. If you feel a bit behind right now, take these simple steps to build your fitness and end up where you want to be. Eric Kenney is the owner and founder of EK Endurance Coaching. Based in Boulder, CO the coaching group offers customized coaching specifically tailored for each athlete. Coaches travel to other parts of the country to coach our athletes in races and frequently run training camps in various locations. Local clients have access to the highest level of coaching right in their own backyard with group rides and runs. Enjoy winter cycling classes, coached swims and the most valuable set of team sponsors and partners. EK Endurance Coaching is currently accepting new clients. 'For more information, visit www.ekendurancecoaching.com.